The Italian ten-year government bond yield continues its ascent, and earlier today it reached a high of 3.74%. The yield remains far away from its 2011 crisis level of 7.50%, but its sharp rise and the increased risk of the Italian government clashing with the EU is spooking investors and causing the Euro to trade lower. First, a high yield will make it difficult for the Italian government to pay back its debt, and there could be a point where the government revenue will only be sufficient to service the debt. I don’t think none of this will happen any time soon, but the rapid move in yields I cause the Euro to soften, and this is something that traders are taking advantage off. How High Could the Yield Rise? On September 28, when the yield was at 3.2%, I said the yield could reach 4.09% on a break to the 2018 high of 3.263%. Today, the yield is at 3.625% and rising. I still think there is scope for the yield to gain in the weeks ahead. 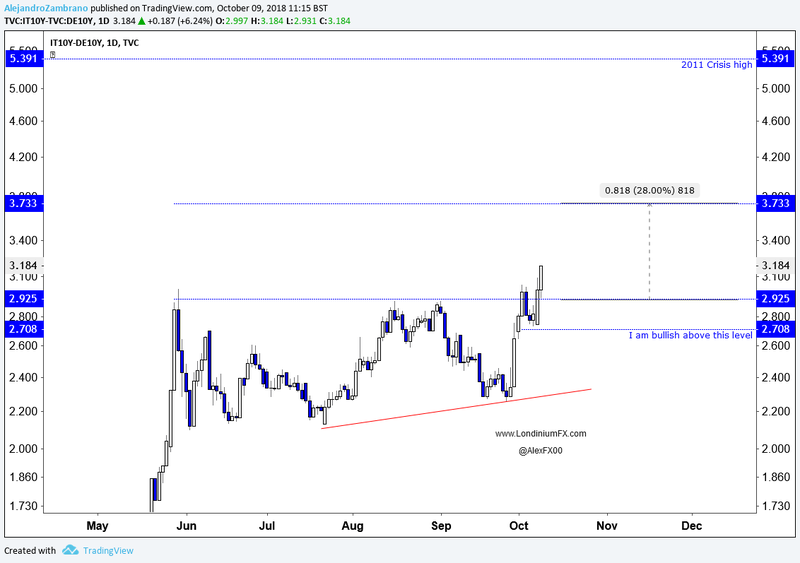 The trend will remain bullish as long as the price trades above the October 4 low of 3.217%. A second variable to focus on is the spread between the Italian and German government bond yields. Today, the yield spread is at 3.184%, and this means that if the Italian government issued a new bond today, they would pay 3.184% more per year than the Germans. 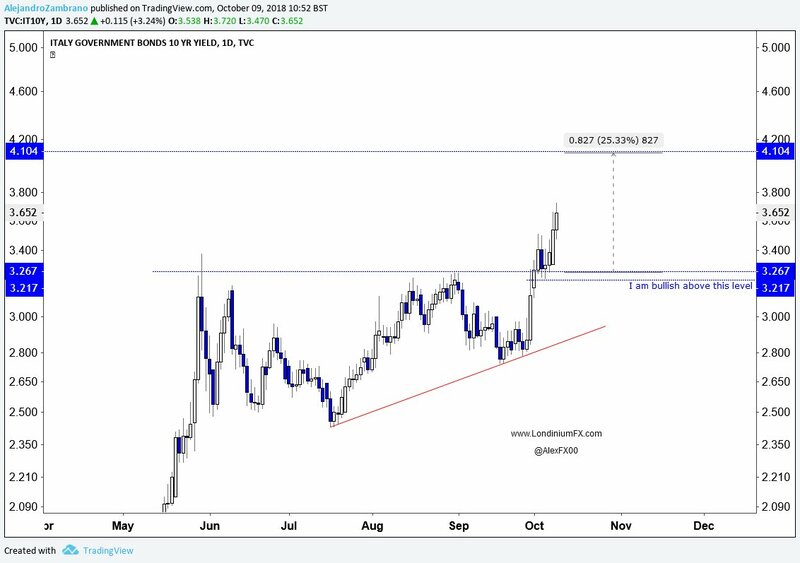 The yield spread does not show a technical pattern of the same quality as in the yield chart seen above, but I am interpreting the yield spread chart as showing an ascending triangle pattern. The pattern is derived by drawing a horizontal resistance level via the May 29, August 16, and September 3 highs, and by linking the July 23, and September 26 lows. The target is obtained by adding the difference between the July 23 low, and the horizontal resistance level, to the September 3 high, and by doing this, we derive a target of 3.73%, a level not too far away from the 2011 crisis level of 5.39%. 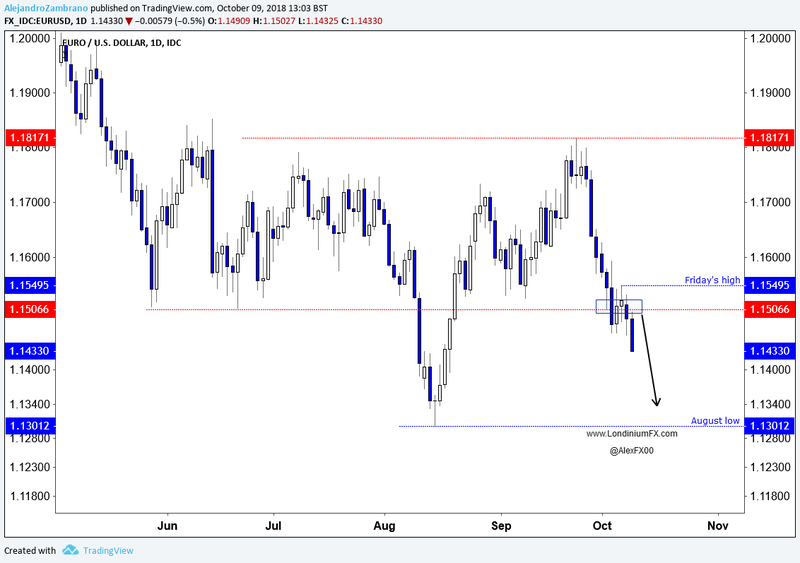 In late September, the EURUSD started to turn lower from about the 1.1750 level, as headlines about the Italian government’s intentions were picked up by mainstream media, and as the Italian government finally announced its plans. A few days later, the EURUSD breached the multi-month range of 1.1506 – 1.1817. I turned bearish, following the break to the range, and I said I would remain bearish as long as the price traded below the breakout candle high at 1.1594. Since then the price corrected higher but sold off as projected, and today the price traded to a new monthly low. As I suspect Italian government bond yields will continue to gain, I think this will further soften the Euro. Going forward, I suspect that any retests of the breakdown level at 1.1506 will probably be met by sellers with stops just above Friday’s high of 1.1549, and their aims set on the August low of 1.13.